As I write this, the panto season is winding to a close and hundreds of actors in the UK are returning to watching Jeremy Kyle and applying for part-time Tesco jobs. Chances are a lot of them will have appeared in one or other variation on the story of Jack & The Beanstalk. If you're not familiar with the story, it's the tale of a young boy who employs perfect 21st Century financial sense by selling his family’s only cow for a handful of beans and seeing it grow into a giant beanstalk. Of course, in the modern version Jack would have sold the cow, launched an Internet start-up company and filled YouTube with videos of the amazing golden egg-laying hen. Gladly, we still like things a little more traditional, as do Amaya, who’ve dived into the panto pool with their take on the Jack tale, Enchanted Beans. 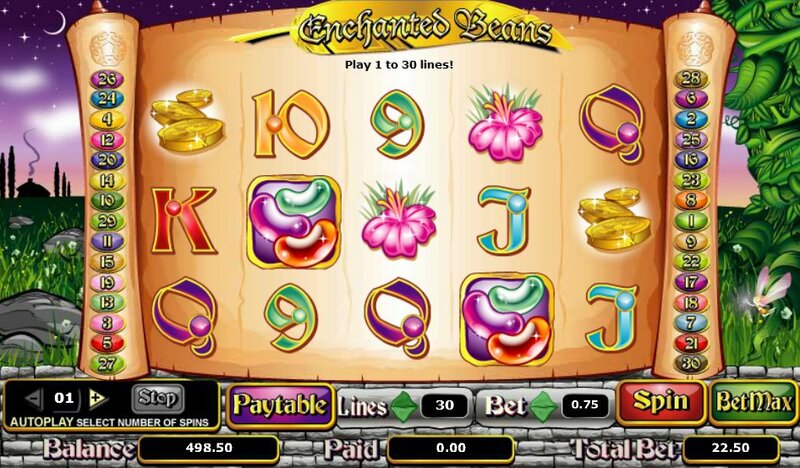 A 5-reel, 30-payline online slot, Enchanted Bean is packed with familiar symbols from the story, including Jack, an Axe, a Castle, a golden Harp, a Flower and some gold. Naturally, the standard 9-through-Ace symbols complete the reels. 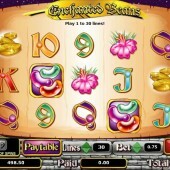 Five castles pays the jackpot of 5,000x your line bet – or $100,000 at the maximum betting range. Jack is Wild... and Grows... Like the Beanstalk! Jack is the game’s Wild, appearing on only Reels 2 and 4 but substituting for all regular symbols other than the Scatter. When the Wild appears on both Reels 2 and 4 simultaneously, they extend to fill the entire reel in lush beanstalk fashion, and the reels will re-spin. The feature ends when the Golden Axe symbol appears on the third reel, so potentially you could be in for a lot of free spins. Therefore, you really don’t want to look out for the Golden Axe symbol as it will send you spinning back to the base game. The Power of the Magic Beans?! The Magic Beans are the Scatter, meanwhile. They don’t trigger any bonus, but two or more symbols anywhere will trigger a nice win. Having some value in the game is OK, but considering they form part of the game's title, you would have thought they would have more significance. If Enchanted Beans has put you in the mood for more fairytale hijinks, don't forget to check out NetEnt’s own take on the panto classic, Jack and the Beanstalk, or Blueprint Gaming's fairytale-themed Wish Upon a Jackpot, which boasts tonnes of bonus features.